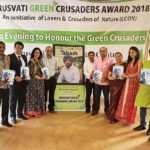 Urusvati Art & Habitat Centre, a paradise of art and culture lovers located at Shikohpur, Gurgaon hosted the first ever “Urusvati Green Crusaders Award 2018 (UGCA)” at its breathtaking premises on September 18, 2018. 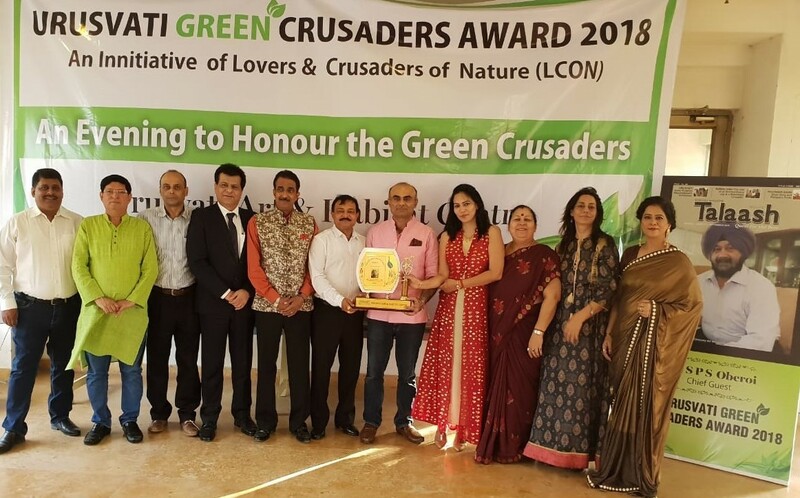 The highlight of the event was the felicitation of environment lovers by a team of likeminded green volunteers named “Lovers & Crusaders of Nature (LCON)”. Spearheaded by senior Media personality Rajni Panwar, LCON had initiated a month long plantation campaign to make citizens aware about the need to plant new trees as well as to adopt them for ensuring their sustenance. The objective focussed around motivating people to come on one forum for ensuring a better healthy tomorrow for citizens by inspiring them to play their respective role in making Planet Earth a more liveable, and a wonderful place. Another aim being to enhance the nature’s landscape by inspiring citizens to become “Bhagidars” in enhancing the Naturescape. Inspired by the scenic ambience of Urusvati Art & Habitat Centre, Gurgaon, LCON chose Urusvati as the venue for their event, and even named their awards after the picturesque destination. 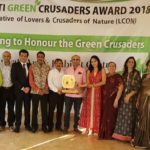 “Urusvati’s Most Inspirational Green Crusader of the Year” Award was conferred on the renowned philanthropist Dr SPS Oberoi. Founder of the international charitable trust named “Sarbat Da Bhala” which means “Welfare of All, Dr SPS Oberoi has accomplished countless humanitarian missions since the last three decades. All these years, he has also been involved in myriad plantation campaigns all over the country. The other UGCA awardees included Icons like Shahnaz Husain (Global Pioneer of Ayurveda & Harvard Subject), Vishal Bakshi (MD-VR Industries), Kamal Singh (Executive Director-United Nations Global Compact Network India (UNGCNI), Jamil Ahmad (Director General-Sarvottam Institute of Technology & Management), Sushil Vakil (Senior Editor), Palvinder & Amanpreet Kaur (Balaji Media), Sunita Vakil (Senior journalist), Archana & Dr Anuj, Dr Ashish Priyadarshi, Usha Thakur & Sudha Sharma (noted social activists), Poonam Saini (Style Diva & Crusader), Hina Shukla (Fashion Designer), Preeti Subberwal (Holistic Wellness Coach, Speaker & Author), Priyanka Behl (Performance Coach & Personality Architect), Sanjeev Dev Malik (CMD/ Editor in Chief – Asian News Channel / GNN – Global News Networks / World News 24×7 / News Age), Dayanand Vats (Eminent Educationist), Mahendr Awasthi (Infomedia), Hema Sharma (Singer), Shikha A Sharma (Celebrity Dietician & Nutritionist) and Mridula Khatri (President, Rotary Club of Delhi Panchshila Park). The awards event was preceded by a stimulating group discussion on exploring innovative ways to inspire citizens towards environment and tree plantation. All the esteemed guests and awardees contributed with their inputs viz a viz reducing air pollution and initiating plantation campaigns in their respective habitats.